Locanda Verde is great, but sometimes you don’t want to wait for a table. (Especially in the mornings when I’m 99% likely to be grumpy.) This is where Maialino comes in. 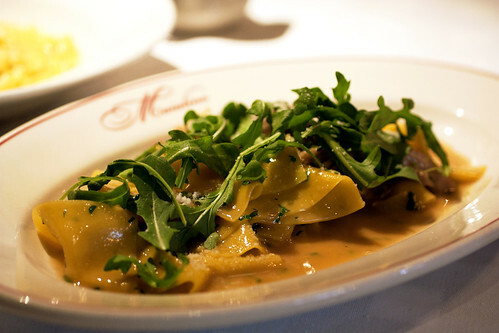 Unlike Locanda Verde, Maialino is on OpenTable and a reservation is only a few lazy clicks away. Of course you can make reservations for Locanda Verde by telephone, but personally, I don’t have the patience to call restaurants. Put me on hold, I’ll just hang up. So although I love Locanda Verde, a few Saturdays ago, the BF and I found ourselves at Maialino for brunch. I started off brunch with a Cortado ($4.25). It was good and strong without too much bitterness. Much like how I feel after my morning coffee. Pastries followed shortly after. 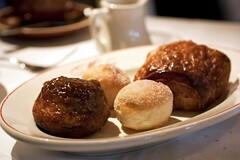 The sticky Brioche Caramellato ($3), a toffee glazed brioche, was extremely rich and buttery tasting. This was David’s favorite. I liked the Bomboloni con Crema ($4), doughnuts with cream, two to an order. The sugary orbs were chewy yet light, and the cream had just the right amount of sweetness. It was great with my cortado. The Pane Cioccolato ($4), chocolate croissant, was flaky, but I found the chocolate inside a tad too hard. It also didn’t help we hadn’t ordered it. David had ordered a glazed croissant, but of course we didn’t notice the mistake until after we’d ripped it apart. At that point it seemed silly to return it. I’ll have to be a better pastry checker next time. Examine first, pounce second. For David’s main course, he ordered (and received) the Cacio e Pepe ($11), a large bowl of soft scrambled eggs with pecorino and lots of black pepper. 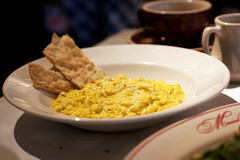 You must love scrambled eggs if you order this dish. It’s a lot of eggs in one sitting. Really well-cooked eggs best eaten with a spoon, but lots of eggs nonetheless. It was brunch, but I wanted pasta so I ordered the Malfatti al Maialino ($21), sheets of torn pasta with suckling pig and fresh arugula. The pasta was cooked al dente and the chunks of pork couldn’t have been more tender, but the sauce — a lovely, salty, creamy concoction of butter and veal stock — really made the dish for me. The stickiness of the sauce really complemented the succulent pork. The fresh arugula, on the other hand, offered some nice contrasting sharpness. After the pasta was gone, I greedily finished off the sauce with some bread. 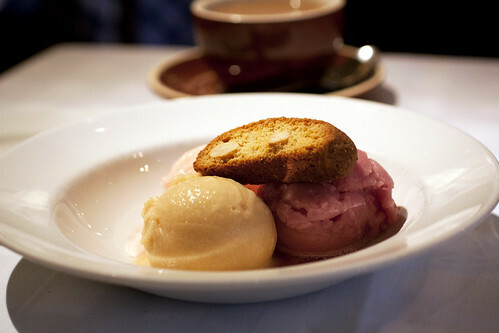 At the end of the meal, I was stuffed, but David was a trooper and ordered a mix of the Sorbetti ($7), three scoops of Maialino’s seasonal sorbet served with a biscotto. I stole a few bites and I was fond of the mellow caramelized pear flavor. For the most part, David also liked the sorbet. His only complaint was that the sorbet seemed to have melted a bit before it got to the table. There was a shallow pool of sorbet meltage at the bottom of the plate. Unfortunately, biscotti fails miserably for sopping. Overall, I still prefer Locanda Verde, but Maialino has its perks: convenience of online reservations and luscious, porky pasta. I have room in my ever-expanding stomach for both. 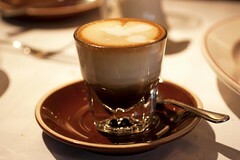 The cortado looks great; the wiki link shows less milk and more coffee. You should have taken a bite or two of the chocolate croissant and told the waiter it is not what you ordered. hehe I wonder how many eggs they used for the Cacio e Pepe (5?). btw, where is your bloody mary? @someguy – I didn’t get a bloody mary because I was planning to go work out after. Of course, the working out never happened, but that was the plan. Next time, glazed croissant and bloody mary for me! Brunch in the city is awesome! So many options too.